As I strolled through Seville on my last morning in the city, I wandered through the streets close to Las Casas de la Judería, the hotel where I was staying, and allowed myself to get lost in the maze and the labyrinth. I had strolled through these streets most days, and always managed to find my way out while stumbling on something new and beguiling each time. The Plaza de Refinadores (Refiners’ Square) is a small, quiet square, known today for its statue of Don Juan. But some of the burial remains found in the former Jewish cemetery nearby are kept in the basement of the public parking lot here. 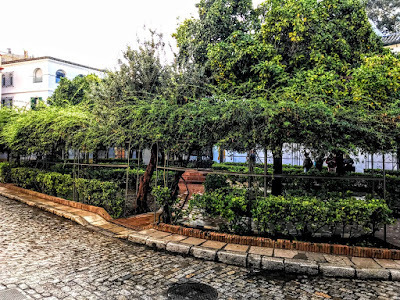 The next square, Plaza Santa Cruz, was once the site of the main synagogue, but the building was finally demolished by the French in 1810, making way for the present square. 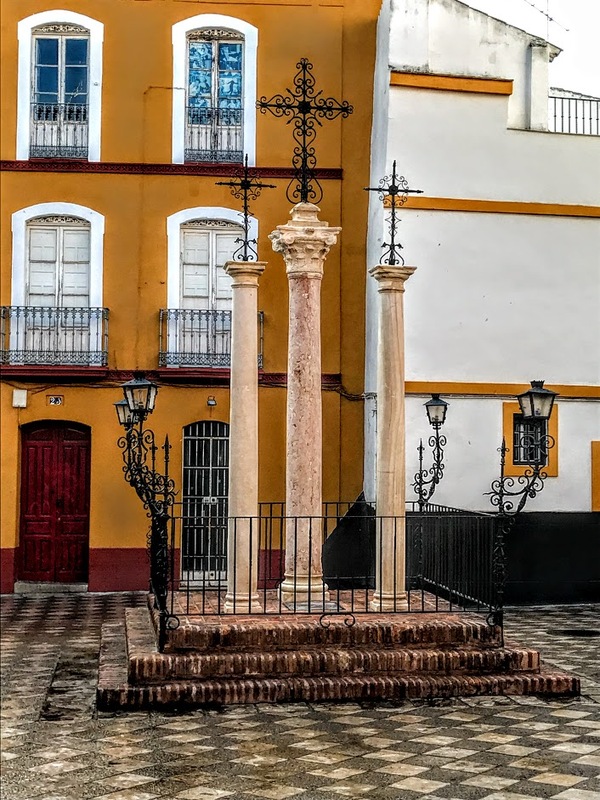 Nearby, a small paved square known as Las Cruces is dominated by three tall crosses, but there is no sign pointing out that this is the place where thousands of Jews in Seville were persecuted and put to death on the night of 5 June 1391. In the heart of this Santa Cruz neighbourhood, leading from the Plaza Santa Cruz back towards Ximenez de Enciso and the Jewish Interpretative Centre, Santa Teresa is a narrow winding street, where the landmark attractions include the Bar Las Teresas, with its rows of jamón Iberico hanging from the ceiling. 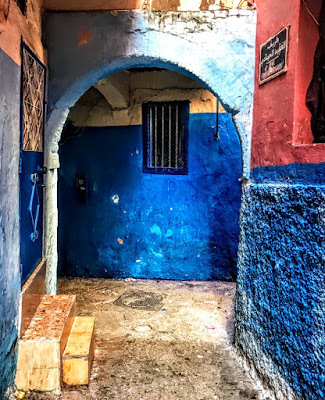 As I wound my way along this street, I found myself in front of an impressive wooden door in an ornate portal set in an otherwise blank and forbidding wall, with just a few barred windows high above near the roof. This is the entrance to the Convent of San José, better known as Las Teresas after its founder, Saint Teresa of Ávila (1515-1582). Saint Teresa is a prominent saint and theologians, a mystic, writer and reformer of the Carmelite nuns, and one of the few women honoured as a ‘Doctor of the Church,’ alongside Saint Catherine of Siena, Saint Hildegard of Bingen and Saint Thérèse of Lisieux. Saint Teresa of Ávila was born Teresa Sánchez de Cepeda y Ahumada in 1515 in Ávila, a small town between Madrid and Salamanca. Her grandfather, Juan Sánchez de Toledo, was a marrano, a pejorative term for a Jew who had been forcibly converted to Christianity, and who had been brought before the Spanish Inquisition in Toledo in 1485 – seven years before the final expulsion of all Jews from Spain – accused of returning to the Jewish faith. Juan Sánchez de Toledo was condemned to wear in procession for six weeks the sanbenito or yellow garment of those condemned by the Inquisition. Later, as was custom, his sanbenito was hung in the cathedral as a reminder of his public disgrace. Her father, however, moved to a more tolerant climate in Ávila, where he tried to hide his family’s Jewish origins, and successfully integrated into society. Teresa’s mother died when Teresa was 14, and she was sent to be educated by the Augustinian nuns in Ávila. At the age of 20 she entered the Monastery of the Incarnation of the Carmelites, a contemplative order that claimed it was founded on Mount Carmel in the 12th century. In the convent, she experienced the ecstatic religious trances for which she is best known, and developed the mysticism that inspired her writings. In her 40s she felt compelled to reform her order, adopting more austere rules and spending more time in mental prayer. She started a new convent in Ávila in 1562, and went on to found 17 others throughout Spain in a 20-year reform movement. On 26 May 1575, Saint Teresa arrived in Seville with a few nuns to found her eleventh convent. 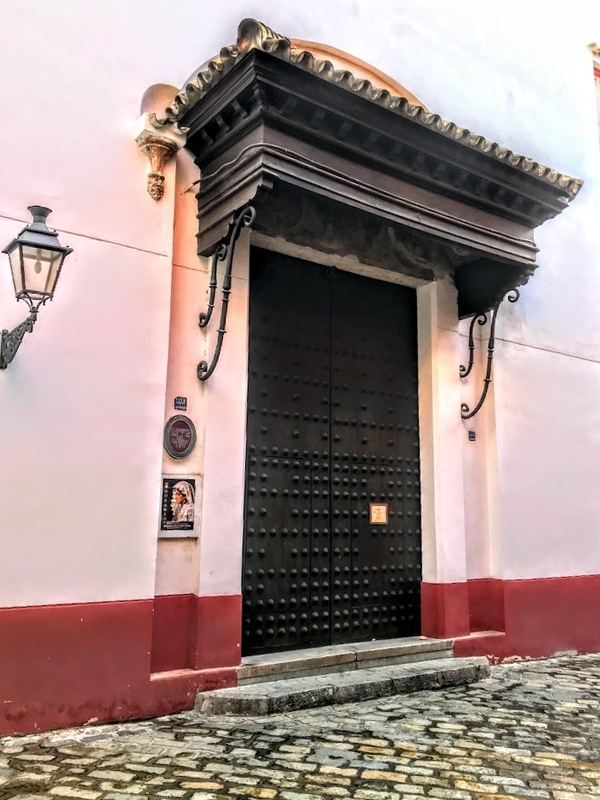 They found a house on Calle Zaragoza, near the cathedral, and the community stayed for 10 years. At the time, Seville was the biggest city in Spain and the main port to the Indies. The city was experiencing its ‘Golden Age’ at the height of trade with the Americas. Besides the Cathedral, there were 30 parish churches, more than 100 hospitals and chapels and representatives from every religious order. On the other side of the Guadalquivir River, the Castle of San Jorge was home to the Court of the Inquisition and the Carthusian Monastery, which she visited while she was living in Seville. However, the location of this convent was never satisfactory. Zaragoza was one of the main streets leading down to the port, a noisy place with taverns frequented by sailors and traders. Eventually, with the help of Saint John of the Cross, Teresa and her companions bought a property in Calle Santa Teresa to build a new home. Her brother Lorenzo, who had been the colonial treasurer in Quito in Peru, had returned to Spain and also helped to finance her new convent in Seville. Her fellow-Carmelite Saint John of the Cross (1542-1591) was also a major figure in the Counter-Reformation and a mystic, and is also recognised as a Doctor of the Church. Born Juan de Yepes y Álvarez near Ávila, he too was a member of a converso family, descended from Jews forced to convert to Christianity. Teresa, however, never saw her order’s new home. While travelling in northern Spain in 1582, she was taken ill and died. In a strange turn of history, she died on the night when the Church was switching from the Julian Calendar to the Gregorian calendar, with the removal of the dates 5 to 14 October that year. She died either late in the evening of 4 October (Julian), or in the early hours of 15 October (Gregorian), at the age of 67. The Convent of San José, or Las Teresas, is not open to the public but holds a number of relics, including the only portrait of Saint Teresa painted while she was alive and the original manuscript of her best-known work, Las Moradas or The Interior Castle. Saint Teresa was beatified in 1614 and canonised in 1622. Many recent studies have pointed to the role of Judaism in her intellectual and religious journey, from Rosa Rossi’s recent biography (2013) to research by Professor Teófanes Egido López of Valladolid University, and the Carmelite theologian Cristiana Dobner. An exhibit in the Jewish Interpretative Centre, around the corner from Las Teresas, points out how an ordinance was approved in Toledo in 1449, excluding converts of Jewish origin from holding public office in the city. This was the first of the ‘statutes of purity of blood’ that excluded Jewish converts from the military, higher education, and civil and church offices. The statues became a breeding ground for extending suspicion, envy, accusations and blackmail. A special group was set up in Seville, los Linajudos, dedicated exclusively to extort money from converts and their descendants by researching their ancestry. The Discalced Carmelite Sisters reimposed the ‘statutes of purity of blood’ in 1597, 15 years after the death of Saint Teresa and six years after the death of Saint John of the Cross. The statues remained in force until 10 May 1865. During my visit to Tangier last week, I tried to find my way into the Spanish mission church in the Soukh, but instead ended up finding two of the hidden synagogues in this Moroccan coastal city and learning about the story of the Jews of Tangier. 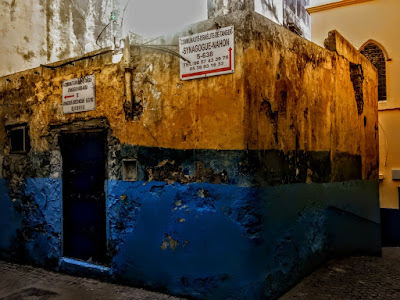 Earlier in the day, some former Jewish homes were pointed out as we strolled through the narrow streets Kasbah, but I had noticed no synagogues or churches, and attracted unwelcome responses at the few mosques I tried to visit. After lunch in the Mamounia Palace, I went strolling through the old Medina and the Rue Es-Siaghinie, lined with cafés and bazaars, jewellers’ shops and an arts centre with displays depicting Tangier’s social history. The Spanish Mission Church, with its domes and large windows, is a Franciscan mission church dating from the 1870s. The doors were closed, and at first I thought directions at a side door were sending me on a wild goose chase. 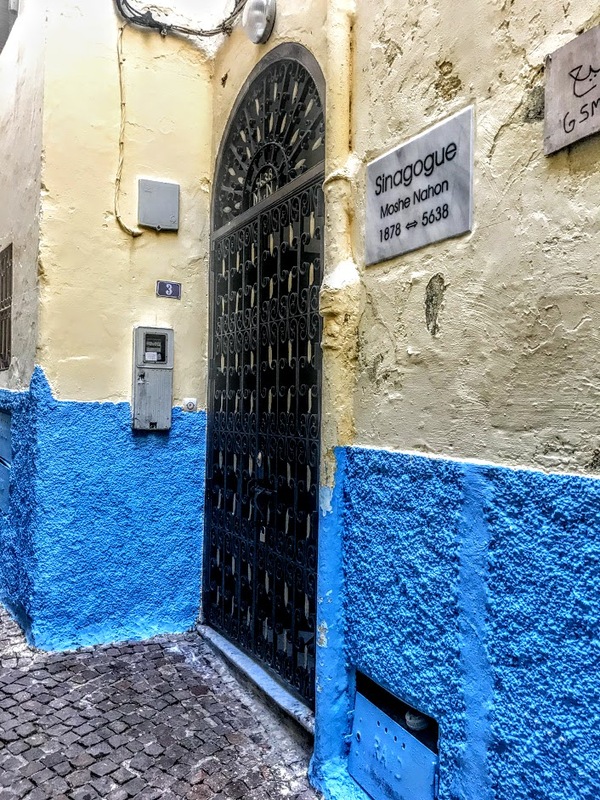 But as I turned the corner I found I was on ‘Rue Sinaguogue’ and with sign pointing to two synagogues on this colourful back street. Unlike Morocco’s other imperial cities in the past, Tangier did not have a walled Jewish Mellah or ghetto. Instead, Tangier had an unprotected Jewish quarter. 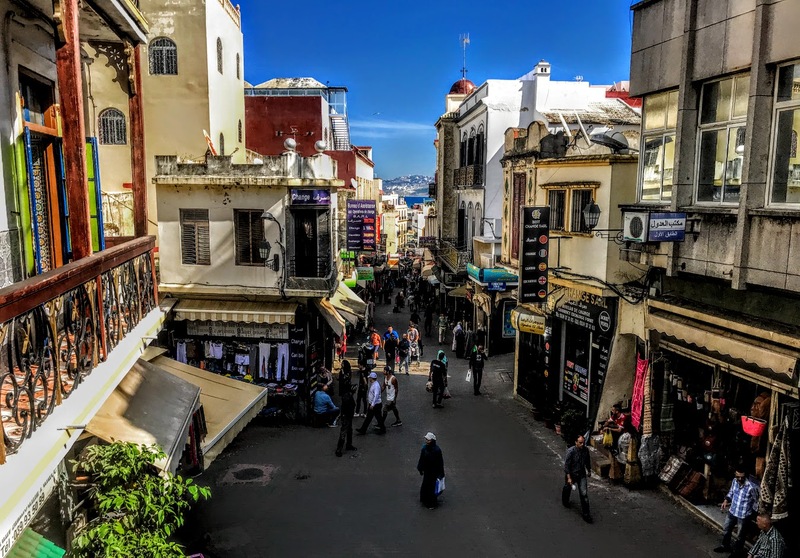 Tangier was first inhabited by the Phoenicians and then by the Carthaginians. Archaeologists have found ceramic objects marked with menorahs that date the Jewish presence in Tangier, then called Tingis, to the period immediately after the destruction of the First Temple. Jewish refugees from Spain fleeing the Visigoth persecutions arrived in Tangier in the fifth and sixth centuries AD, bringing with them their culture, industry and commerce. Several Berber tribes converted to Judaism and Jews lived in peace in Tangier for the next several centuries. Abraham Ibn Daud and Joseph Ha-Kohen record how the Jewish community in Tangier was destroyed by the Almohades in the year 1148. 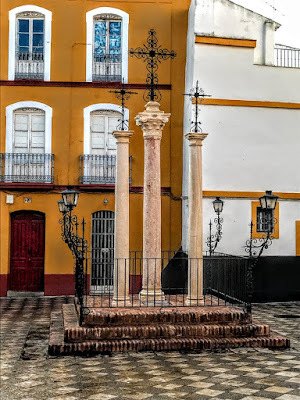 Jewish refugees expelled from Spain in 1391 brought new life to the community, and the Jewish population of Tangier grew again with the arrival of refugees expelled from Seville, Cadiz and other parts of Spain by the Inquisition in 1492. 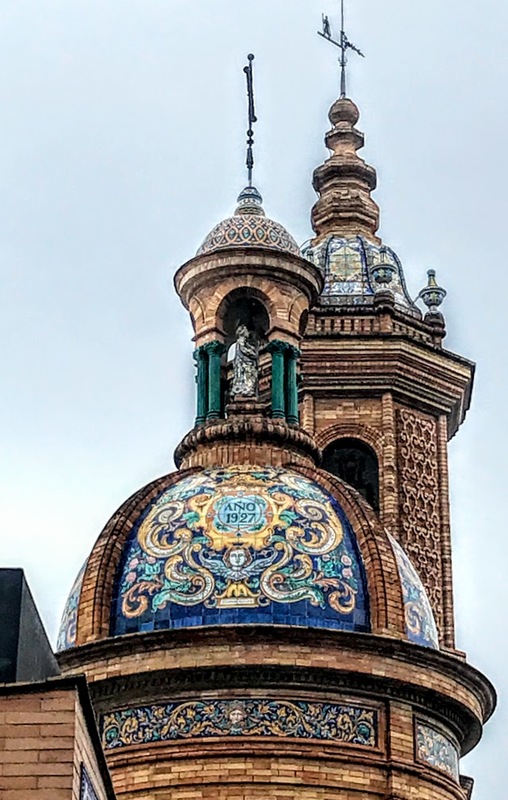 These new immigrants brought with them their Andalusian Sephardic liturgy, creating a Moroccan Jewish culture with a distinctive Sephardic identity. Small numbers from the Jewish communities of Azemmour and Safi settled in Tangier in 1541 when it was ruled by the Portuguese. However, the community eventually came to the attention of the Portuguese Inquisition, which tried to outlaw Jews living in the city. When the Portuguese ceded Tangier to England in 1661, another wave of Jews and Muslims arrived in the city, particularly from the neighbouring towns of Larache and Ksar El-Kabir, along with a small number of Jews from the Netherlands. 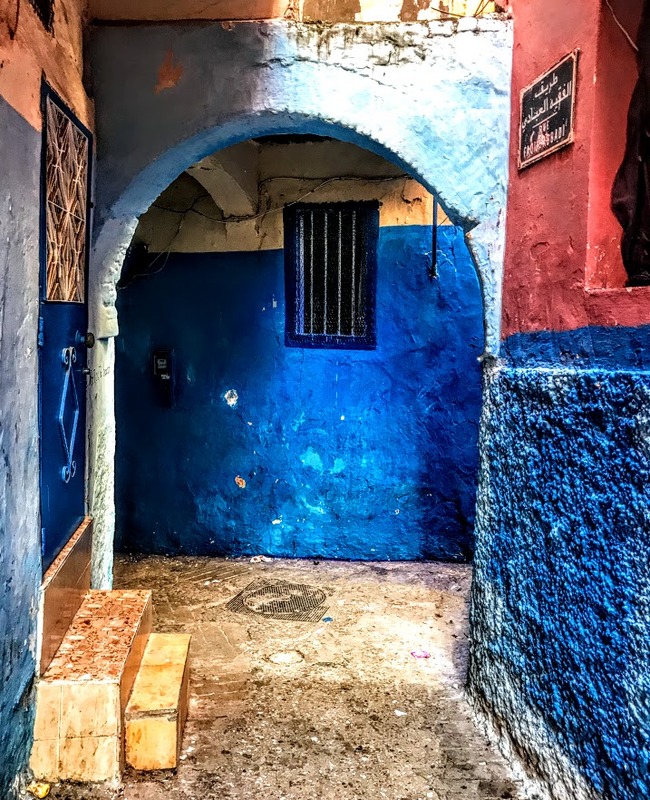 In 1675, tensions boiled up between the Moroccan-born Jews and those from abroad who had arrived in Tangier, and the rabbis of Tetuan issued an excommunication or cherem against the new arrivals. The Jews were expelled from Tangier in 1677 and did not return until 1680. 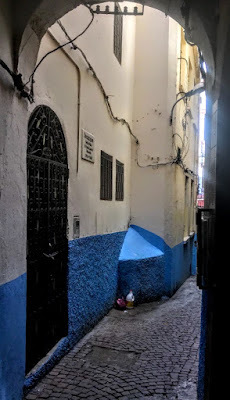 Although the Jewish community of Tangier was generally poor, a number of notable figures lived in the city, including Solomon Pariente, an adviser and interpreter to four successive governors; Samuel de Paz, a British diplomat; and Jacob Falcon, who played an important role in building relationships between the English and the Muslims. However, the English withdrawal in 1684 ushered in a new phase of economic decline, and most Jews left the town. By 1725, only one Jewish merchant, Abraham Benamor from Meknes, remained in the city. With the support of Moses Maman, the sultan’s treasurer, he began to organise a new community as Maman encouraged Jewish merchants from Tetuan and Rabat to move to Tangier with the promise of some tax exemptions. The new community soon numbered about 150 people, and Rabbi Judah Hadida, the first dayan or rabbinical court judge of Tangier, became its leader in 1744. When Christians were excluded from Tetuan in 1772, many European consulates moved to Tangier and the consuls were followed by their Jewish interpreters. However, the majority of the Jewish community in tangier continued to live in poverty. Unlike Jewish communities in Europe, the Jews of Morocco suffered little or no government-sponsored violence. But all this changed under Sultan Mulay Yazid. In a brief reign of terror, many prominent court Jews were executed, including Jacob Attal who was executed in Tangier in 1783. Jewish houses were pillaged, people were killed, and women were raped. The Jewish community of Tangier recovered in the early 19th century. There were fewer than 800 Jews living in Tangier in 1808, but by 1835 they had grown in numbers to 2,000. The community, however, was still poor, despite the presence of the Nahon family, who were successful wax traders, Joseph Chriqui of Mogador, and the Abensur, Sicsu, Anzancot, and Benchimol families. Life was difficult for the Jewish community in Tangier during the Franco-Moroccan War of 1844. But the community escaped the French bombardment and celebrated a special Purim known as Purim de las Bombas (‘Purim of the Bombs’). By 1856, Tangier was the largest port in Morocco. Life improved with the arrival of a new group of Jews from Tetuan, and numbers rose to 2,600. By 1867, there was a community of 3,500 people, and the French school, Alliance Israelite Universelle, opened in 1869. Many Jews were involved in a new Moroccan press based in Tangier, founding and editing news newspapers, published in English, Spanish, French and Arabic, and calling for the Europeanisation of Morocco. Jewish authors and poets, many writing in Spanish, also flourished in Tangier. The Jewish middle class founded hospitals and numerous welfare institutions in Tangier. The Jewish intelligentsia, including the historian Jose Benoliel, the kabbalist Sanuel Toldedano, and Abraham Laredo, were involved in reviving Jewish culture. When the French Protectorate was established in 1912, Jews were given equality and religious autonomy. By the time Tangier became an international zone in 1923 administered by France, Spain and Britain, over 10,000 Jews were living in the city. But many more emigrated to South America or settled in Casablanca. With the outbreak of World War II and the beginning of the Holocaust, many Jews fleeing Eastern Europe sought refuge in Tangier from 1939 on. By the 1940s, there were 22,000 Jews in Tangier and Morocco’s Jewish population reached its peak at 250,000 in 1948. About 12,000 Jews were living in the international zone that year, and by 1950 they were joined by 2,000 Spanish Moroccan Jews, so that the community in Tangier numbered about 15,000 people in 1951. After Moroccan independence in 1956 and the annexation of Tangier, several Jews, including Solomon M Pinto, tried to preserve the community of 17,000. But emigration had begun; Jews from Tangier helped to build a new Jewish community in Madrid, others settled in Geneva, Canada or the US, and a few hundred emigrated to Israel. By 1968, the number of Jews in Tangier had fallen to about 4,000. By 1970, only about 250 Jews were left in Tangier. Today, the synagogues, cemeteries, monuments and communal institutions of Tangier show how important Jewish life has been in the city over the centuries. At one time Tangier had over 20 synagogues. On Rue des Synagogues, many of the synagogues are now closed, but I found signs pointing to two of them. The Synagogue Rebbi Akiva on Rue Synagogue was originally built in the mid-19th century. It was restored by Rabbi Moshe Laredo in1902, and was rebuilt in 1912. More recently it has been converted into a museum of Tangier’s Jewish community, but it was closed when I visited on Thursday afternoon. 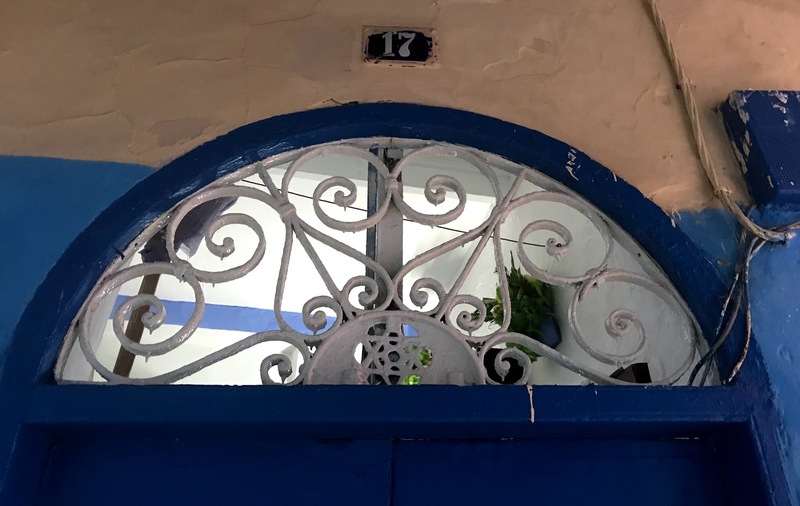 At the very end of this twisting and turning street, behind a nondescript door, I found myself outside the Moshe Nahon Synagogue, the last surviving functioning synagogue in the old city. From the street, appearances are deceptive, but inside this is a monumental and lavish building, and one of the most beautiful synagogues in Morocco. Chaar Rafael on 27 Boulevard Pasteur is another surviving synagogue in Tangier. This Jewish-owned villa was built in 1919, and was converted into a synagogue in 1954, when the owner Raphaël Bendriahm died. 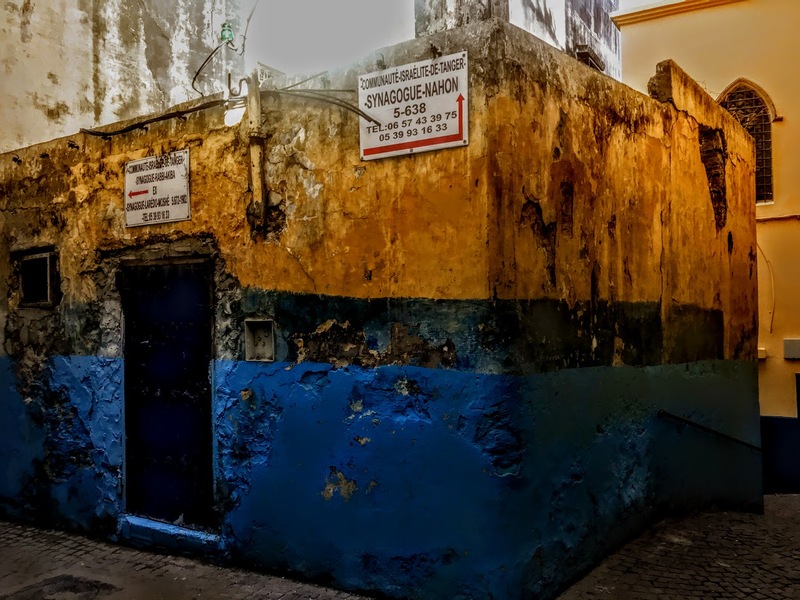 The Jewish Cemetery in Tangier, known as the ‘old cemetery,’ has more than 1,000 graves, some dating back to the 16th century, with tombstones in Hebrew, Portuguese and French. Today, there is a vibrant Jewish community in Morocco numbering about 2,000 to 2,500 people. Moroccan Jews make up the second largest community in Israel, and Moroccan Jews and their descendants can be found in France, Canada, Spain, the US and Venezuela. 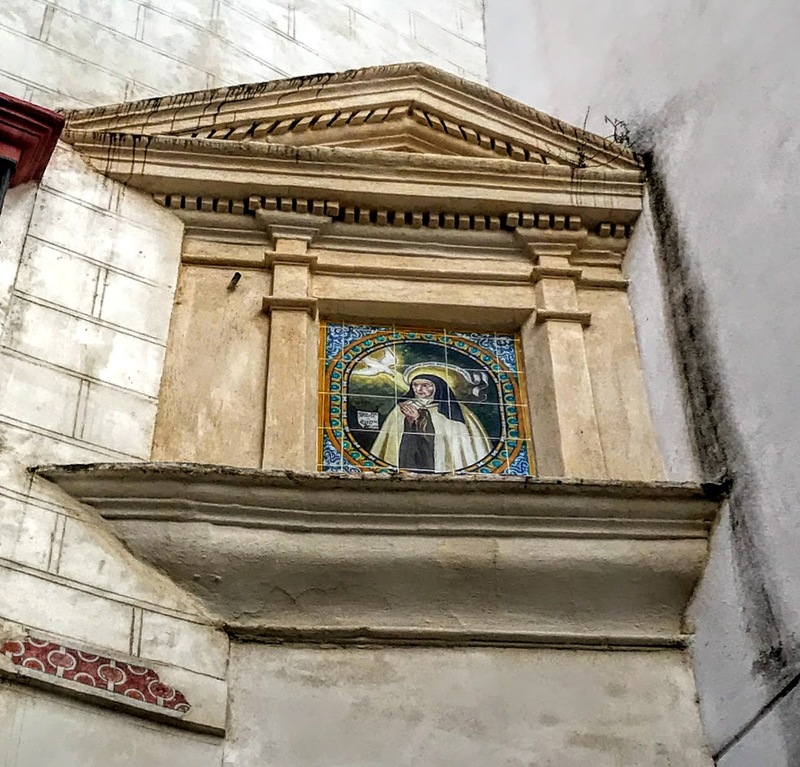 I never found my way into the Spanish Mission Church, nor did I find Saint Andrew’s Anglican Church before I left Tangier on Thursday evening and returned to Seville. But I found evidence of an openness and tolerance that many people do not expect in islamic-majority and Arab-speaking countries in North Africa and the Middle East.